Gapers Block Book Club blog out of Chicago highlights Norman Maclean today—specifically his book, A River Runs Through It. You might remember a little Robert Redford film was based on it. If I didn’t dislike Redford’s politics so much, this would be my favorite movie of all time. I have tried to disassociate the movie from the men, and the screeplay from the story. When I lived in Bozeman, Montana, I met some of the folks who worked behind the scenes and visited shooting locations. I tried to imagine the Rev. Maclean preaching behind the same pulpit at First Presbyterian Church in Bozeman many years ago. We only have one chance to make a first impression. 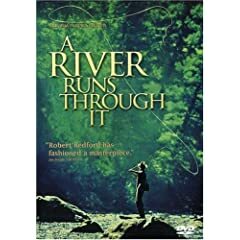 My first impression of A River Runs Through It originated in the movie, not the story. I visualize an actor, not a writer and professor. I see the Gallatin River, not the Big Blackfoot. I see Hollywood under the Big Sky. I have the opposite experience with Maclean’s also excellent book Young Men and Fire. A friend who had visited Seeley Lake told me about the event and recommended the read. I have yet to visit Mann Gulch myself. Yet I can visualize the location in my mind like I lived there. Someday somebody will put this story on film. There’s a script in circulation. They will probably shoot in Canada or Southern California because they have no respect for the role of Place in our lives. The images will blur, but not for me. And not for you if you go read the book now. Friends don’t let friends see movies before they’ve read the book. I never saw the movie, precisely for the reasons you give — why hand my money to people I disagree with so profoundly. I very much like your observations about how things like that affect our response to stories. I also really appreciate the comment about Hollywood having no respect for the role of Place — because it does matter. Of course, they have respect for so few things, like history and truth, that I seems fitting they’d ignore other elements. Thanks for the observations. Now I’m interested in reding Young Men and Fire. In most cases it’s better to read the book first, but a recent notable exception (for me) was seeing *No Country for Old Men* as a film and then reading the novel. The film hewed so close to the book that I found it a delight to read afterwards. Ms. Australia- What a great photo in the header of your blog! I’ve recently rediscovered the glory that is a public library system. In Minnesota anyway, our libraries are linked so we can quickly and easily request material from far and wide. I haven’t checked out movies here, so I’m not certain they work the same as books, but it’s better than a donation to Amazon if you don’t want the trophy for your shelf. Robby- I did the same as you, went out and bought “No Country for Old Men” right after leaving the movie theater. I’m a long-time fan of the Cohen Brothers (I did grow up in Fargo after all) and I was quite impressed after reading the book that they hewed so close to the written word. Then I gave the book to a friend to read. I don’t know if you intended the juxtaposition, Rob, but No Country was shot in and around Marfa, Texas, home of Tift Merritt’s interview show–which I blogged on just a couple posts ago. Small World. Nope, that was completely coincidental. But oh how I wish I was both all-knowing and unbelievably subtle, so that I COULD have intended it. Maybe I could get some $$ from the Marfa area tourism & visitor’s bureau, or http://www.traveltex.com. Does sound like they’ve got a pretty cool arts scene going on there in the Big Bend country.